Just a quick update. Australian Customs and Quarantine were much easier than we thought they would be. We'd been told they'd take virtually all our food and that they could take several hours (at US$130/hr) tearing apart the boat. In fact, they were very professional and even friendly. Quarantine introduced themselves, took a quick look at all the food we'd put out for them and declared most of it just fine. In the end, all they took was some cheese, butter, 1 lime, and our garbage. They took a look at our hull for any fouling, but since we'd just cleaned it, there was no problem. They seemed apologetic about the whole thing and said cleaning your hull just before arrival was just fine with them. Customs was obviously interested in drugs, but rather than tearing Ocelot apart, their approach was to talk to us about our trip: where we'd been and what we'd seen. They soon decided that 3 family boats with teens was not a major drug threat and wished us a pleasant day. All very courteous and professional. 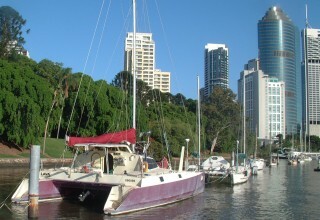 After spending some time at the dock, cleaning up and filling with water, we headed up the Brisbane River. This was a delightful meander, past the big, bustling commercial docks and all the riverfront activities. After sailing about 2 hours and under 2 bridges, we got to "the pilings" - an array of concrete posts that the boats tie between. 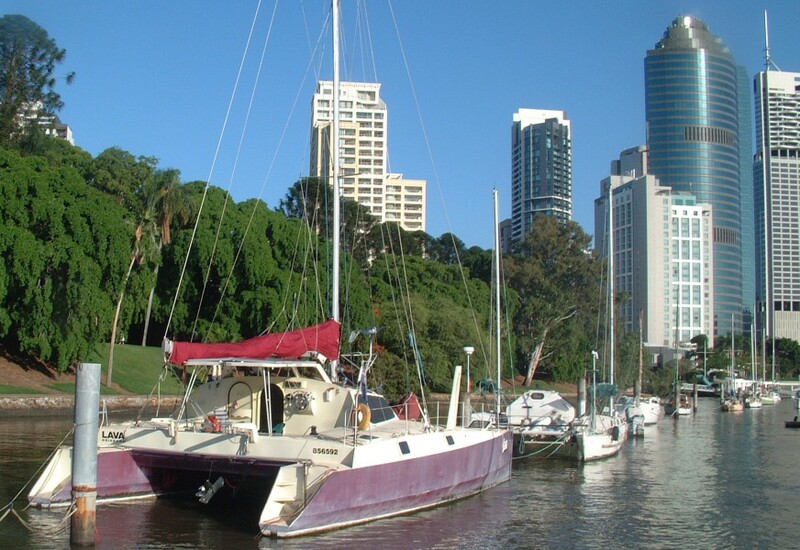 So we're currently moored in this amazing spot right in the heart of Brisbane. Just next to us are the delightful Botanic Gardens, yet 3 blocks away we're in the heart of downtown skyscrapers. There are extensive and elaborate walking promenades on both sides of the river which we use morning and evening for jogging, biking, or just walking. At night we have stunning views of the downtown lights, the river, lit cliffs on the far side, a beautiful Storey Bridge (also lit), and of course all the river traffic. Truly a million $$ bit of real-estate (for which we pay about $5/day). 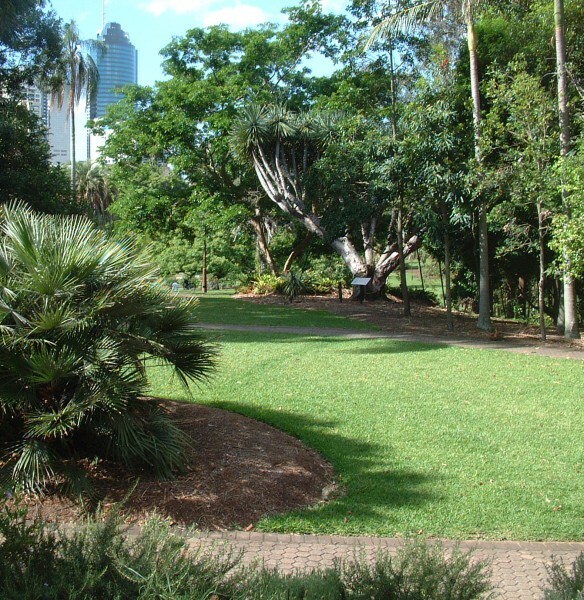 Our plans are still coming together, but it looks like we'll probably stay in the Brisbane area for a month or so. We're protected from most cyclone problems, there's LOTS of stuff to do here, and we want to be around our friends for Thanksgiving and Christmas. We'll probably buy some sort of touring vehicle and go on a road-trip in early 2006. Once the cyclone season ends (April) we'll start sailing north to Bundaberg, the Great Barrier Reef, the Whitsunday Islands, and eventually Darwin by June or July.